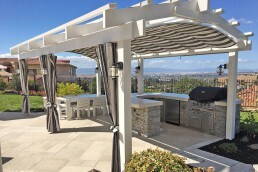 A well-designed outdoor living space creates a dynamic that is warm and dear. Choosing a component as the focal point allows a design to follow through with finishing touches. 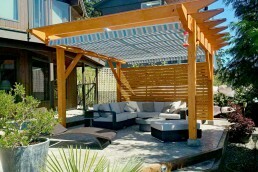 In this case, vision from an existing stylish outdoor space with all the right elements sparked a look-a-like project. Located in Southern Ontario, Oakville’s outdoor season is short but sweet. 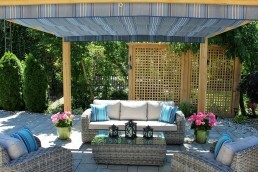 Rain or shine, homeowner Liane B. knew she wanted to create a cozy gathering point in her backyard. With this in mind, Carruthers Landscaping hand-crafted a pergola for a comfy seating area. They also worked with ShadeFX for a sun and shade solution. Carruthers Landscaping specializes in custom landscaping for clients located in the Golden Horseshoe. Their professional and skilled designers helped these homeowners re-create an admired space. 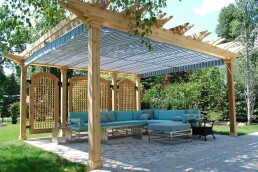 Through design and build, Carruthers specified a 10’ x 10’ manual retractable canopy for their pergola. 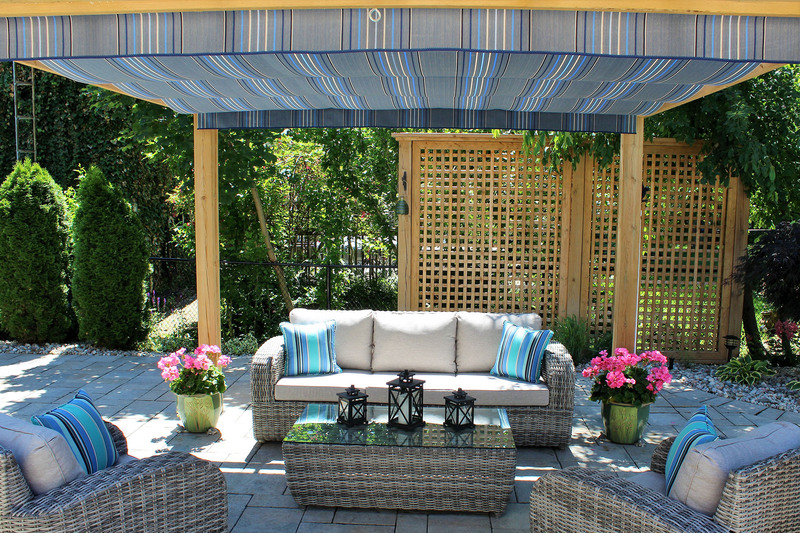 Liane B. also chose the same eye-catching Sunbrella motive denim to complete her space. Small accents such as flower pots can add pops of vibrancy in outdoor spaces. Placing lattice walls in key areas can help define spaces and add privacy. Larger pieces such as multi-coloured canopies can also add character. 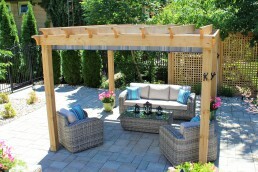 Establishing your outdoor living space starts with the main element followed by the finishing touch. As a matter of fact, it can double as both. 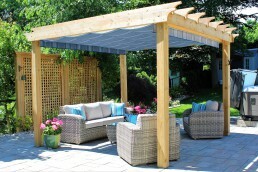 Add the finishing touches to your outdoor living space. We can help. 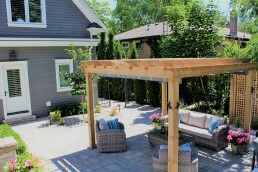 Carruthers Landscaping worked with these homeowners to re-create their outdoor living space. 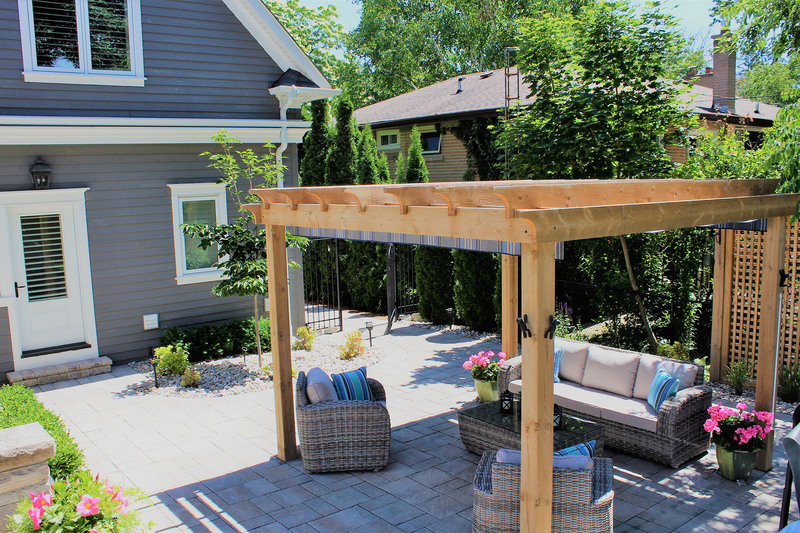 Through design and build, they specified a 10’x10’ manual retractable canopy for their pergola in the Sunbrella motive denim fabric. Lattice walls were installed to define the space and give additional privacy.